Celeste Ng’s second novel, Little Fires Everywhere, opens with the line: ‘Everyone in Shaker Heights was talking about it that summer: how Isabelle, the last of the Richardson children, had finally gone around the bend and burned the house down.’ Set in the mid-1990s, the novel follows two very different families over the course of a year, slowly building to the aforementioned fire. The Richardsons are a wealthy married couple with four children, a big house, deep ties to their community, and everything they could ever need. Mia and Pearl Warren are a mother and daughter who drift from town to town, never settling, living on the edge of poverty. When Mia rents an apartment from the Richardsons, unexpected connections build between the two families. However, relationships are strained by a public custody battle around a Chinese–American baby: the Richardsons are friends with the white couple trying to adopt the baby and Mia works with the baby’s birth mother. Ng’s debut novel Everything I Never Told You was a critically acclaimed bestseller and Little Fires Everywhere is equally compelling. Ng inhabits eight or nine different characters with ease, each portrayed with authenticity and understanding, and she expertly brings together a range of plot threads into a satisfying, resonant ending. 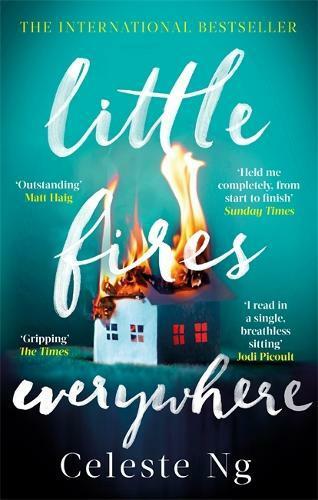 An emotionally complex, richly detailed drama about motherhood and belonging, Little Fires Everywhere is not to be missed.